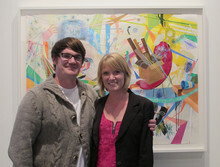 San Francisco’s in-the-know art scene gathered recently at 941Geary for the gallery’s appropriately titled inaugural show, “A New Beginning”. The 3,000-square-foot converted warehouse, that formerly housed a smog and emissions check garage, is the latest endeavor from SF gallery guru, Justin Giarla (Shooting Gallery, White Walls, Gallery Three). The gallery, a monstrous hidden treasure in the Tenderloin, is still undergoing renovations and opened, purposefully, with no advance press. The soft opening was a success, though, and with such a powerful space and the vision of Giarla, this is definitely the gallery to watch this year. The current show at 941Geary, “A New Beginning” runs through July 10th, and is a collection of mainly large-scale paintings by such artists as the Clayton Brothers, Kofie One, Mark Warren Jacques, and Erik Otto. The gallery will continue to have monthly group shows throughout the summer, featuring works by Shepard Fairey, Van Arno, Aaron Nagel, Casey Gray and more. Mike Shine's circus show (the official launch of 941Geary) will begin September 18th and will end with a grandiose Halloween party in October. Giarla's right-hand gal, Leigh Cooper, who is director extraordinaire of 941Geary, Shooting Gallery and White walls, gave us the first scoop on the mysterious new space. SF Station (SFS): Why did you decide to use the address as the name of the gallery? Leigh Cooper (LC): We brainstormed a bit, but decided to keep 941Geary. The logo emphasizes the number 4 because this is Justin's fourth gallery. 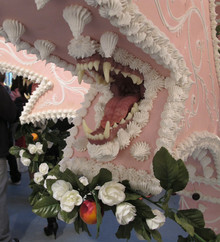 He started Shooting Gallery in 2003 and then opened White Walls in 2005, and Gallery 6 in 2009. SFS: How did you come to acquire this amazing space? LC: We wanted to have a pop-up gallery for our Mike Shine show in September. While looking, this space popped up around the corner (from Shooting Gallery and White Walls). We came down to take a look and knew immediately that we had to have it. It was very spur of the moment and everything organically manifested itself into what it is now. SFS: I see why you jumped on the space. What's special about the Mike Shine show and what kind of space were you looking for? LC: As far as installations go, we've just about done everything we can with the other spaces — torn down walls, built walls, Erik Otto even built a small house inside White Walls. When looking for a space, you have to think about the kind of art that you want to show. Mike Shine is going to have an actual carnival in 941Geary — a tent, games, music, everything. We're so excited. SFS: Wow, that sounds amazing. Since it's a permanent space for you now, how will 941Geary differ from Shooting Gallery and White Walls? 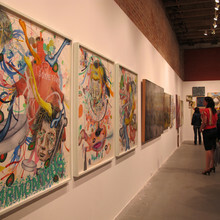 LC: Justin started Shooting Gallery as a low-brow, counterculture gallery. He'd go to the galleries at 49 Geary holding his skateboard, and people would look at him like he was crazy. He wanted a place where anyone could come in and not feel pressured to buy something. White Walls started as an urban street-art gallery. It wasn't necessarily for graffiti, but anything that wasn't in a gallery that needed to be seen by the masses. 941Geary is a space where artists can go crazy and be inspired to do massive installations without worrying about being in our way.